The Buddha never saw an automobile. But I think if he had, he would have had lot to say about cars. As a society, we view the commute as an obstacle not only to where we want to be but even to our own sense of well being. The Buddha, perhaps, would have pointed out some of the marks of commuting that we usually fail to put together. We are alone, and therefor free, we are sitting in the midst of change, it is a very good time to exercise awareness and care for other beings, and most of what we do flows from the unconscious when we drive. There will be challenges on this road, but it is the meeting of challenges that makes us grow. This is a rare opportunity in our day. We think we are driving. Or at least the self likes to claim credit for our ability to operate an automobile. The reality though is different. Operating a vehicle, like walking, is not the kind of activity that the rational mind does well. Synchronizing pedals, wheels and gears to respond to myriad conditions transforming at a high rate of speed is something that can only be done well by the body mind. When the car in front of us slows suddenly, we hardly notice as our foot presses the brake to slow in unison with the car ahead without startling the car behind us. Trouble occurs when we see the car ahead and a momentary stupor arises as we look for a rational reason why something that should not be happening is. There is just too much going on for the self to possibly track and we’ve all had the experience of locking up only to find our foot pushing the self out of the way and jumping for the brake. This being the case, a zen koan naturally arises. Who is it that drives the car? There really isn’t much need for self on the way to work. Since mindfulness is paying attention, focusing that attention on here and now, and staying curious, and this just happens to be the best use of self behind the wheel. It is an opportunity to do what we try to do in zazen, to sit still and let the deeper parts of ourselves teach us some wisdom. There is even a buddhist teacher, Obante Ubaratana, who has made it his mission to serve as a driving instructor in Maryland. There is sitting meditation, walking meditation, and there is driving meditation too. First, a warning, the kind of stillness we are talking about here is an inner stillness. While complacency might sometimes seep harmlessly enough into our sitting zazen, sitting behind the wheel of a car is obviously a time to wake up. So let’s begin with a cautionary tale from Bodhipaksa, a Vipasana practitioner and the founder of Wildmind. Once I was talking to a woman at a workshop I was leading in Spokane, and she related that she’d once been so engrossed in a mindfulness tape by Thich Nhat Hanh that she’d rear-ended a truck. It’s for that sort of reason that I’ve never acted on any of the suggestions various people have made over the years that I should record a CD about mindful driving. So what could Zen Driving look like? A person could begin by taking three breath breaths before turning the key. It is good to pause and set an intention before beginning an endeavor. Behind the wheel you can make a commitment to be aware of this world and the many, many changes you are about to encounter. 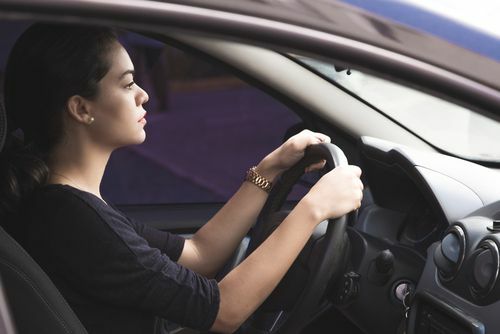 You can take the stance of observing the mystery of driving, acknowledging the skillfulness of the body in maneuvering through the world and appreciating the many ways it cares for you. Finally, it is freeing to remember that you are a bodhisattva on a journey to save all beings and to help them. Realize that you are enacting the spiritual journey and turn the key. Watch the body. Look at your hands on the wheel and and notice that they know every intimate detail of of the craft of driving. You might notice there can be a moment of pause, a bit of clinging of self and the car doesn’t move, try to just step back, and as you do, the hands will move and put the car in gear. They know what they are doing. Pay attention to all the movements that are made to drive the car. Don’t get lost in them but stay fascinated with all the fine tuning that happens as the wheel turns and the feet move and notice especially that there has been a lot more happening to operate this car than the self ever understood even while it thought it was doing it all. This might also be a good time to notice a curious thing, Our deepest self can transcend the body. We don’t usually notice this even when we put on a new pair of shoes and adapt to our new dimensions without stumbling, or even when we parking in a tight space looking toward a bumper that can’t be seen and thinking that there’s not enough room but then we pull in anyway. Strangely, we are almost never wrong about this. You can feel it. The car is an extension of you. This is something worth considering because this merging of self and car has many aspects, some crucial to our survival today, and some not good. There will be many examples of both on the road to day. This is a good time to really practice some basic wide field Zen awareness and in this this particular seat of practice, you get to look around. Change is everywhere. You are passing many beings in the midst of their lives and there is precious little time to ease their suffering. There may the occasional opportunity to smile at someone, but mostly you might notice that moving through the world in a way that leaves the smallest wake is the best way to help them. Here’s a chance to get real with the basic practice of not creating karma. You can remind yourself that every moment you spend practicing will build the skills that will help you down the road when you get where you are going. Listen to the sound of the road and the wind and feel their texture. Feel the texture of the road. Notice that you are more than you thought. If you can be one with this car, you can be one with anything. All along the way there is always something that you didn’t notice. Wake up and discover everything you can. All along the way, teachings about dharma and opportunities for practice will arise. You may discover traffic, perhaps a lot traffic. Perfect. You have found a a good and simple way to work directly with the four noble truths. Looking around, we can really notice that we are in the midst of a lot of suffering, all of it arising from an attachment to an imagined world where things are different. We can notice how our clinging to a speed of travel can seem to diminish everything. Looking at these circumstances stretch on for miles, it is impossible to not to notice the choice we have been given. We can wish it were different and be unhappy, or we can accept it and return to our zen driving and enjoy this moment. Fortunately, there will be time to really understand this. The good news is that if we practice patience on the way in, the rest of the day is going be easier. Arriving at our destination, a monk in street clothes might sometimes remove the key and take a moment to listen to the silence. Noticing a different quality of awareness at the end on such a little sojourn on the path, the gratitude that might arise could be answered with an intention to carry this spirit through the door of the building where we have arrived.